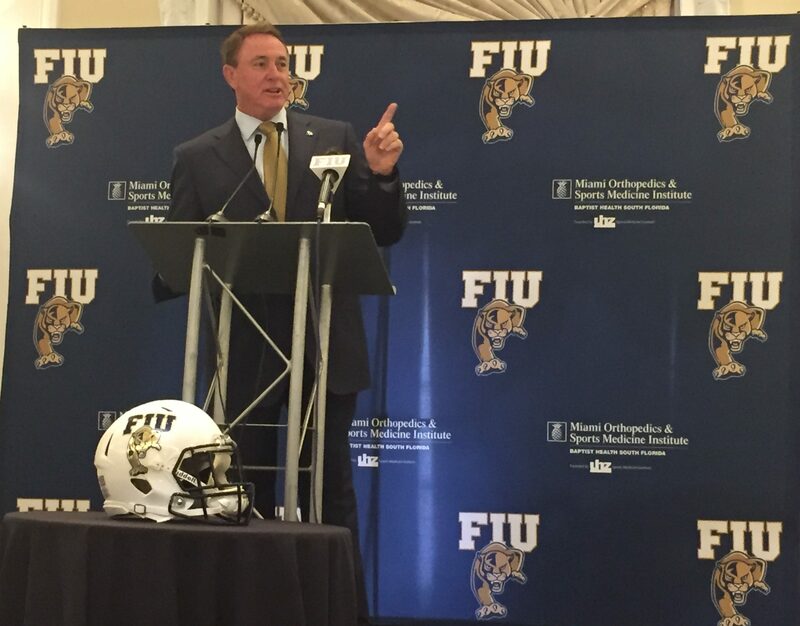 Butch Davis introduces the 2018 recruiting class to fans gathered at the Vinoy Renaissance Hotel in St. Petersburg on Dec. 20. The Panthers will face the Temple Owls in the Gasparilla Bowl on Dec. 21. 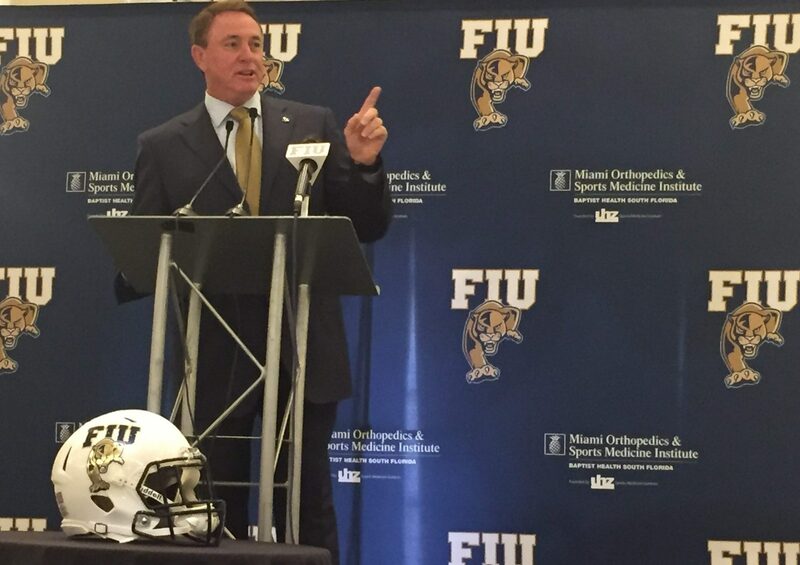 In a word, FIU football just got bigger – a lot bigger. On the eve of the Bad Boy Mowers Gasparilla Bowl, Head Coach Butch Davis announced on Dec. 20 the addition of 21 student-athletes to the program’s 2018 recruiting class to kick off the early signing period for college football. This year’s recruiting class includes some of the highest-recruited players to ever sign with FIU and adds some considerable size to the Panthers on offense and defense. The Panthers added five defensive linemen, including four-star defensive tackle Tayland Humphrey. Considered by most recruiting services one of the best junior college defensive linemen in this year’s class, Humphrey is one of the highest-rated players to sign with FIU in school history. Humphrey, who played last season at Hutchinson Community College in Kansas, chose the Panthers over offers from Alabama, Oklahoma State, Arkansas and a host of other prolific programs around the nation. His brother, offensive lineman John Bolding, is also part of this year’s recruiting class. According to Davis, who started his coaching career as a defensive line coach, the 6’5, 350-pound Texas native is expected to be a game-changer on defense next fall. On the offensive side of the ball, the Panthers also added some size with the addition of offensive linemen D’Antne Demery (6’5, 320 pounds), Miami Palmetto wide receiver Ivan Thomas (6’4) and tight end David D’Meara (6’5). With linebackers Anthony Wint and Treyvon Williams wrapping up their collegiate careers at FIU, the Panthers also filled that need with three-star Champagnat Catholic linebacker Donovan Georges, who had offers from Georgia, Alabama and others. The Panthers continue to make the state of Florida a key part of their recruiting strategy – 14 of the new recruits are from the Sunshine State. Davis and his staff branched out their geographical footprint in order to fill needs on the roster, going all over out of state in hopes of establishing pipelines from Miami to Jacksonville and everywhere in between. “High school coaches know we are going across Florida to look for players, and I think that will pay dividends in the future,” Davis said. With several scholarships still left, the coaching staff will go back on the recruiting trail after the Gasparilla Bowl. The Panthers take on the Temple Owls on Thursday, Dec. 21, at Tropicana Field. Tickets for the Gasparilla Bowl are still available for fans who want to cheer on their team. The game kicks off at 8 p.m. and will be televised on ESPN. For more information, visit Bowl Central. BEST WISHES FOR THE SUCCESSFUL FOOTBALL SEASON 2017. BEST WISHES IN THE SPECIAL BOWL GAME DECEMBER 21, 2017. YOURS TRULY, Alumni 1975. VIETNAM VET 1968. MARINE CORPS.